Registering for an account is quick and easy. Registering doesn’t cost anything, it’s simply for accountability. We just ask that if you’re going to use CloudLab for anything other than light use, you tell us a bit more about who you are and what you want to use CloudLab for. Users in CloudLab are grouped into projects: a project is a (loosely-defined) group of people working together on some common goal, whether that be a research project, a class, etc. CloudLab places a lot of trust on project leaders, including the ability to authorize others to use the CloudLab. We therefore require that project leaders be faculty, senior research staff, or others who are relatively senior positions. 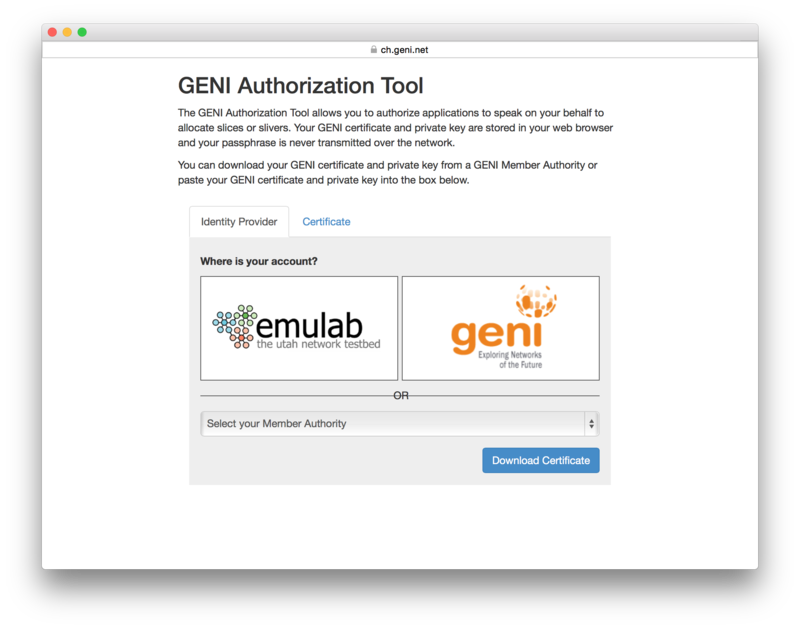 If you already have a GENI account, you may use it instead of creating a new CloudLab account. On the login page, select the “GENI User” button. 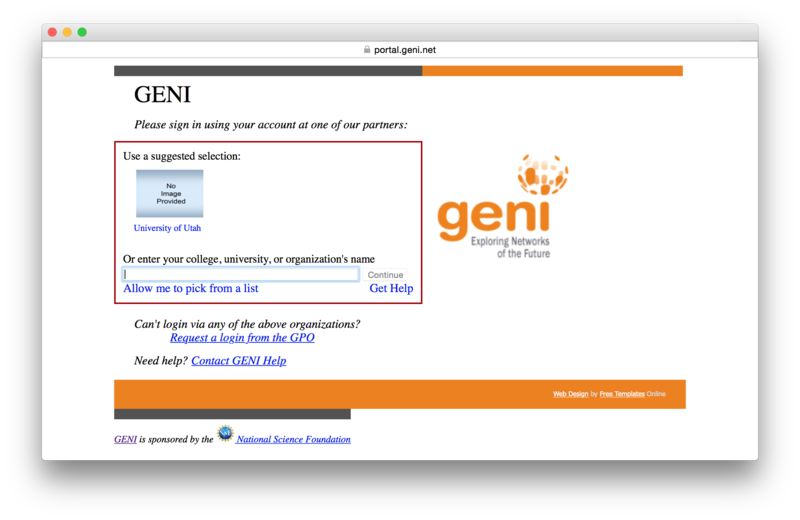 You will be taken to a page like the one below to select where you normally log into your GENI account. 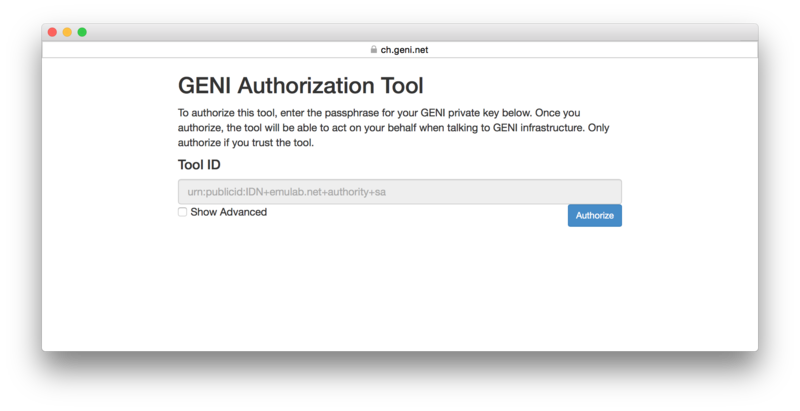 From here, you will be taken to the login page of your GENI federate; for example, the login page for the GENI portal is shown below. That’s it! When you log in a second time, some of these steps may be skipped, as your browser has them cached. To get an account on CloudLab, you either join an existing project or create a new one. In general, if you are a student, you should join a project led by a faculty member with whom you’re working. If you already have an account on Emulab.net, you don’t need to sign up for a new account on CloudLab—simply log in with your Emulab username and password. 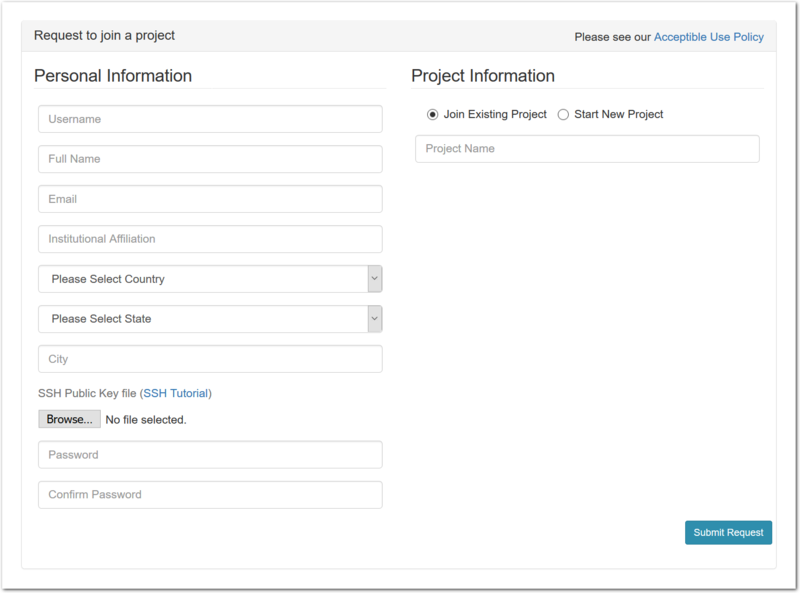 To join an existing project, simply use the “Sign Up” button found on every CloudLab page. The form will ask you a few basic questions about yourself and the institution you’re affiliated with. CloudLab will send you email to confirm your address—watch for it (it might end up in your spam folder), as your request won’t be processed until you’ve confirmed your address. You’ll be asked to enter the project ID for the project you are asking to join; you should get this from the leader of the project, likely your advisor or your class instructor. (If they don’t already have a project on CloudLab, you can ask them to create one.) The leader of your project is responsible for approving your account. You should only start a new project if you are a faculty member, senior research staff, or in some other senior position. Students should ask their advisor or course instructor to create a new project. 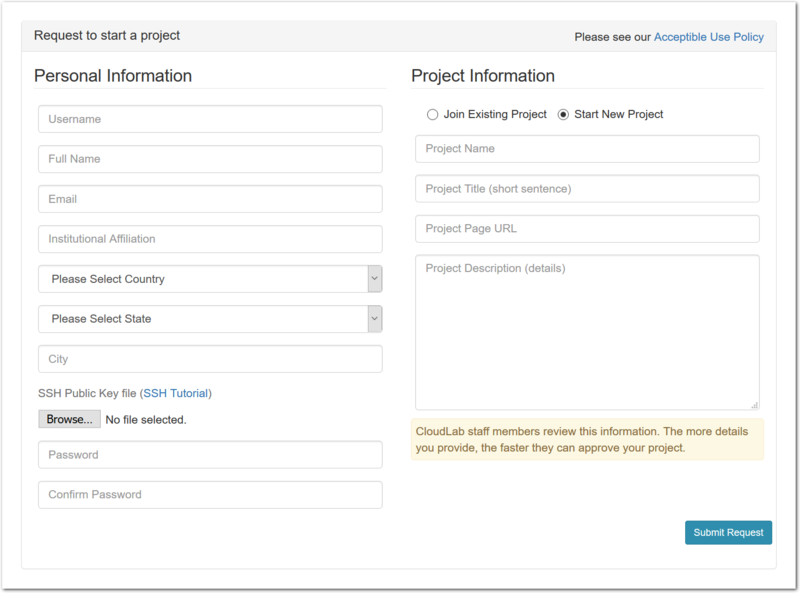 To start a new project, use the “Sign Up” button found on every CloudLab page. In addition to basic information about yourself, the form will ask you a few questions about how you intend to use CloudLab. The application will be reviewed by our staff, so please provide enough information for us to understand the research or educational value of your project. The review process may take a few days, and you will receive mail informing you of the outcome. Every person working in your project needs to have their own account. You get to approve these additional users yourself (you will receive email when anyone applies to join.) It is common, for example, for a faculty member to create a project which is primarily used by his or her students, who are the ones who run experiments. We still require that the project leader be the faculty member, as we require that there is someone in a position of authority we can contact if there are questions about the activities of the project. Note that projects in CloudLab are publicly-listed: a page that allows users to see a list of all projects and search through them does not exist yet, but it will in the future.